Make good use of old valentines or those you find on sale after the holiday. 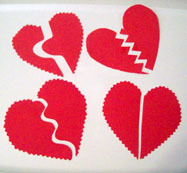 Attach the valentines to self adhesive magnetic sheets; then cut them apart. Use the magnetic valentines on your chalkboard or at a center on a metal cookie sheet. 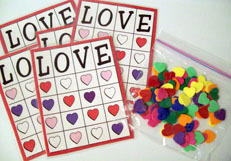 Have youngsters use the valentines for matching, counting, sorting, or memory games. Encourage the children to play "I spy" looking for items that are red or pink. Add a new twist to the traditional game of tic-tac-toe with conversation heart candies. drawing a tic-tac-toe grid in the center. Then laminate the heart for durability. Next, gather five pink conversation hearts and five green conversation hearts. on the gameboard. The game ends when a child places three of his hearts in a row. will do what the heart instructs. Go around the circle till each child has several turns. Click HERE for printable of Love Bingo Board Game. they are or turned into a file folder game and laminated. heart half. Encourage them to name the shapes or numerals on their halves. giving each child a different heart half each time. Hide four or five valentines around the room. Let your child try to find them all. find all the valentines before the timer goes off. Use a red button, if possible. Children pretend it is a tiny valentine heart. who has the button. This child asks another until the button has been found. Insist on clear speech; for example: Question: "Billy, do you have the Valentine?" Answer: "No, Sally, I do not have the valentine." put on. Help the children identify the letters on their necklaces. Then let them walk around to find their "alphabet heart mates." Variation: Write matching numerals on the pairs of necklaces. Or draw on matching shapes such as circles, squares, and triangles. fly. The child who picks up the most hearts and the one who finds the special pink and red heart are the winners. hiding the mail. If he guesses correctly, he continues as postman. If he guesses incorrectly, the person with the mail becomes the postman. out at random to children. Ask the children to match their heart halves. he or she names something or someone he/she loves. To begin form a circle, the children hold hands with their arms held up to form doorways. a heart from the middle and then goes in and out the windows while the others sing the song. Valentine, Valentine through my window. Pick a little friend and give her a valentine. I'll give you a red valentine! valentine must now give it away. The game continues until every child has had a turn to give away the valentine. by dropping the heart in back of the child and saying "Be My Valentine." The selected child stands up and chases the other child to the empty place in the circle. Cut a heart shape out of a large piece of red paper. Hang the heart at your children's eye level. clean up. Have the children put their stickers on their doilies before going to the next activity. Let them take their doilies home at the end of the week. pumpkins, a bare tree with fall colored leaves, a Christmas tree with ornaments, etc. any more friends, but if they try very hard, they can probably help their friends find a spot on the heart. They may have to help by holding onto their friends or "hugging" them so they won't fall off the heart. stop the music. Continue until only one heart remains and all the children are touching part of the heart. your child. Invite your child to line up the hearts from smallest to largest or from largest to smallest. Make a Tic Tac Toe board from construction paper. Use heart shaped erasers as the tic tac toe markers. given part of a heart and must find his/her partner by matching the valentine halves. can guess what's inside. Have them close their eyes. Open the box and let each child sniff the chocolate. Now can they guess what is inside? If you wish, let each child have one of the chocolates at snack time. "make a funny face," "tell a joke," "sing a song," "pretend your are a bird (or another animal),"
numerical order. Make sure that the numbers are visible and the messages are face down. Let the children take turns rolling dice and turning over the heart that bears that number. Read the messages and encourage children to act them out. Continue until all children have had a turn. Variation: The game is endlessly variable by changing the messages on the backs of the hearts. and having the children find the objects and bring them to the circle. This eliminates the need for reading. set time) ask them to find the hearts. Have the children gather to circle once they have found their hearts. Cut a heart shape out of red construction paper. Turn on some lively music. whoever is left holding the valentine says one nice thing about each person in the group. on the circle, below the circle, or above the circle. This activity will help children learn those positions. or craft store. Cut a groove around one end of the dowel rod about one inch (2.5 cm) from the end. paper. Attach a large paper clip to each heart. Instruct a child to fish for a certain size and color. But signed it "guess who!" Our hearts are just alike you see. So, stand up if it's you! have the children listen carefully. When they hear the color of their valentine, have them hold it up in the air. Repeat the last verse, replacing the underlined word with other body part words in turn, such as head, arm, and foot. each child to place his/her valentine in the box when the color is mentioned in the song. And send love, oh so fine! Repeat placing the underlined word with pink and white in turn. And sent my love so fine! sneaking up to the door and pretending to push button. All the children must run to safety. Make a circle. Child in the center will be the Valentine. Children will skip around singing. The child in the center will point to a child who will say the color for the last line of the song. Then the child chosen will take place in the center and the game will continue. Child sings, walks around the group and hands a child a Valentine. child to stand when the number is sung. When counting from ten the child will sit down. This can aid in counting, number recognition, simple addition, and subtraction. One red, two blue, three green valentines. Four orange, five yellow, six purple valentines. Seven black, eight brown, nine pink valentines. Ten white valentines for you. his/her heart to the next child, until all the children are stuck together. Then sing the last verse of the song. name yourself). Then let the other children take turns saying something nice about that child. Continue in the same manner until each child has received his or her "valentine compliments." construction paper heart for each child. Laminate the cutouts for durability. game is a wonderful way for youngsters to form some heartfelt friendships. hearts, then stop music. Children "wake up," then search for hearts. Children can take turns hiding hearts.